This is when it all got serious. 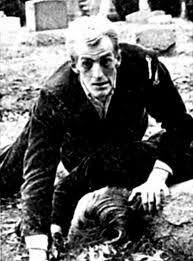 There had been zombie films before but with Night of the Living Dead George A. Romero and John A. Russo stuck a giant undead flag in the ground proclaiming a new era for the genre and dictating how zombies would behave for a generation. Night of the Living Dead follows the fortunes (or misfortunes) of a small band of disparate survivors brought together in cramped conditions having to cope with the highly confusing and ultimately dangerous situation of dozens of mindless killers banging at their door wanting to come in and eat them. The iconic film opens with Barbra (Judith O'Dea) and Johnny (Russell Streiner) on the annual pilgrimage to their fathers grave when they're accosted by what would arguably become the signature modern cinematic zombie, played by Bill Hinzman. With Johnny overcome the hysterical Barbra flees for her life over roads and fields until she comes across a farm cottage. Here we're introduced to the hero of the film Ben (Duane Jones) who seems to have not only some-idea about what's happening but the ability to act on the knowledge to defend and protect himself and Barbra. The duo are soon joined by married couple Harry (Karl Hardman), Helen Cooper (Marilyn Eastman) and their injured daughter Karen (Kyra Schon) and teenage couple Tom (Keith Wayne) and Judy (Judith Ridley) who have all been hiding in the cellar. What we end up with is power struggles, disagreement on what they should be doing and petty squabbling all intensified by the pressure. This becomes the template for survival zombie films for years to come; the idea of putting a small mixed band of characters together in an intense volatile life or death situation and seeing how they react and interact, and you can see its influence in everything up to and including The Walking Dead. Obviously influenced heavily by the US space program and the alien invasion films of the previous few decades Romero and Russo originally came up with the idea that the monsters would be flesh eating humans infected by aliens but ended up with the idea of the dead come back to life; flesh eating still the main trait though. Romero has stated that this was part based on a short story he wrote that ripped off Matheson's I Am Legend, which had vampires albeit slow zombie like ones in it. The space influence didn't get pushed off the table altogether and hints that the cause of undead rising is actually from radiation from a satellite that returned from Venus, though Romero and Russo are keen to point out that this is neither confirmed or denied in the film and the actual cause was left ambiguous. 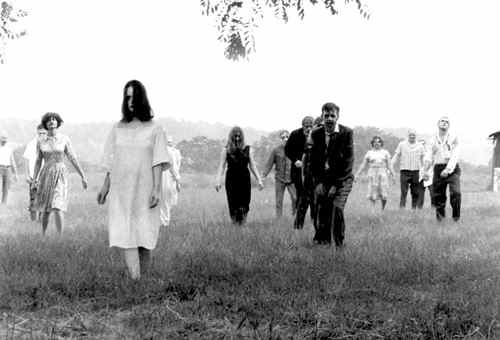 An interesting feature of the Night of The Living Dead ghouls is their hatred for light and fire and some slightly higher brain functions than the mindless meat-heads seen in later films. Probably brought across from I Am Legend's vampires, these zombies actively smash headlights with rocks, stay away from the house while the lights are on and shun fire. One failed escape to a government sanctuary later and once the lights and electricity of the farm house go out that the heat turns up on the survivors. This leads to a faster paced action laden final 20 odd minutes with all the gore and scenes that riled up the press back when it was shown (albeit in a time before certification and to young adults and some children who were expecting a light horror matinee experience), including a quite harrowing scene even by modern standards with a young girl and her mother. For a film made on a self financed shoe strong budget, the quality of acting and production is quite high, Duane Jones being the pick of the bunch. Casting a black lead at the time and pitting him successfully against an antagonistic self absorbed white Karl Hardman also saw Romero and Russo accused of deliberately creating an anti-racist sub text, but I really don't think they could ever be accused of thinking that hard, he was lead simply because he was a good actor and at most they were happy to cause a little trouble. And ok, one could pick holes in some of the other acting, especially Judith Ridley, but none of it really detracts from the experience. The viewer should also be careful when selecting a version to watch. The film is in the public domain due to a copy right bungle back in 1968 so anyone is free to make a release. There's quite some debate as to what version to buy but the Optimum Home Releasing Blu-Ray version I've reviewed seems to be the best for picture quality, which I'd testify to but is beaten by the some of the DVD releases for commentaries and extras which this version is sorely missing. 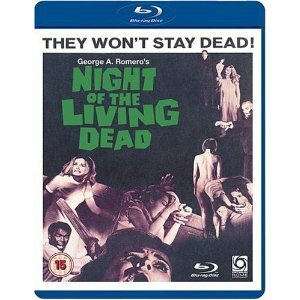 Night of the Living Dead holds up pretty well even today. For a 1968 film , shot on a low budget with b-movie actors and a very slow first hour it's still pretty captivating stuff. Ok there's plenty to laugh at too these days from the special effects to the shambling groaning zombie horde yet it all really still works. It's the formula that's right and there's a reason others stuck to it. A film that inspired a genre, I'm coming to get you Barbra, 8/10.